After a big climbing trip, my body can feel pretty wrecked. Upon returning from Switzerland I can home with a few souvenirs. I gained about 10 lbs of weight in Europe, much thanks to the affordability of the world's best chocolate and maybe the cheapest 6 pack of beer I've ever seen. Also, came home with a little elbow tendonitis. It is pretty standard to come back with a few bumps and bruises, and the body must heal before the next adventure. That's what I've been up to. Now I'm in the southeast USA again. I've been doing a little work for my parents, healing my tendonitis through rehab, catching up on resistance training, and getting ready for the next journey. It's a bonus that I get to do it here in the south which has some of the best sandstone around. 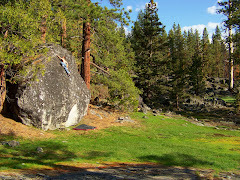 The main areas that I've been cycling through are Rocktown, Citadel, Hospital Boulders, etc. The list of projects for me is growing everyday. I'm mainly focusing on mileage at the moment but have ticked a few good moderates while here, including the Iron Claw sit start. I had never done this line before but it was truly stellar. It has perfect compression with big moves. It also has one of the coolest pinches I've seen. It's been great getting my bearings in this great sandstone dreamworld. The rock out here is getting me ready for the next adventure, which will be a two week trip through the west with my buddy Brad Perry. We'll be going through Vegas, Moe's, Joe's, Salt Lake City, and then Ibex. Utah is in the cards for January. I hope for good weather and good sending mojo.